Half pics have been edited tonight. Hope to have this post completed tomorrow... Sat at the computer for a couple of hours instead of going for a ride... cry cry cry! Easy Fella, rest assured that your posts are informative and inspirational to all. You can never stop learning, and your inovation and expertise are a credit to you. Any body can do what has been shown on these threads. Just takes information, practice and self confidence. If you want to do something, have a go. If its structural and you are not experienced, ask. ...and others who don't do anyting, because they have no confidence and are afraid to ask. Great thing about these forums is that we each have the opportunity to learn from others, so we can have a go AND get a pleasing, safe result. Bloke told me the other day he was dumb because he had no fabricationg skills... but he is a computer wizz. No... it's just a case of information, practice and confidence. Last edited by Prof on Thu Jun 26, 2008 11:03 pm, edited 1 time in total. This is a set of aftermarket torpedos often used on Harleys... and unfortunately they have a large inlet pipe diameter as a result. 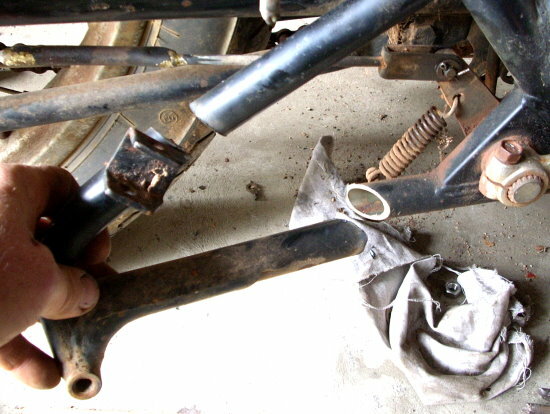 Although they look great, a couple of bent pieces of exhaust will have to be found as well as sleeving the pipe up ¼" to match the mufflers. Here is a genuine set of early seventies tulip megaphones. They have been dechromed to see if the metal is thick enough to rechrome... unfortunately not. 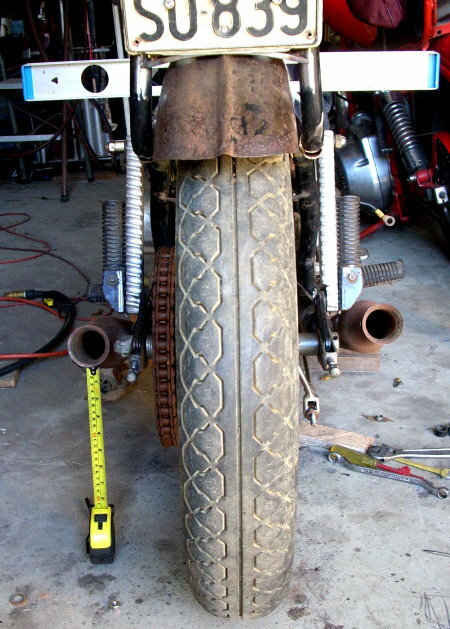 A new matching set could be made by local motorcycle exhaust shop but will cost $150 each. These are the right diameter and nicely upswept, so will get a heat proof paint job and get used for the time being. 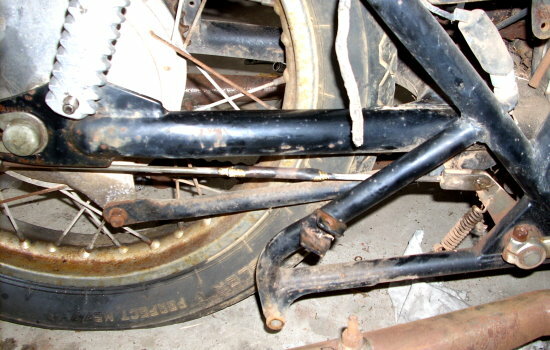 This exhaust/rear footpeg subframe needs modifying. 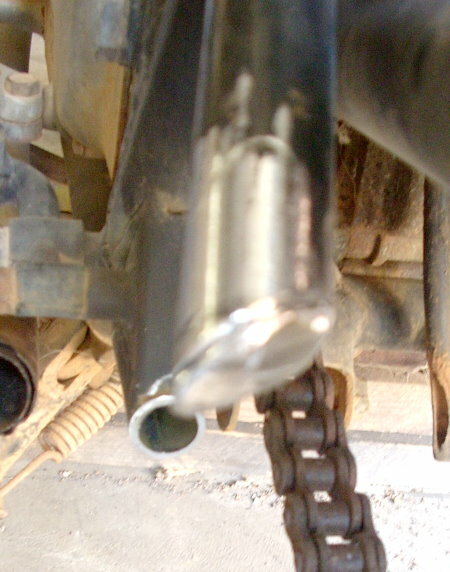 It is way too close to the ground and is in the way of the mufflers. Rear footpegs will be mounted on the bottom strut mount. Cut them off to new length. 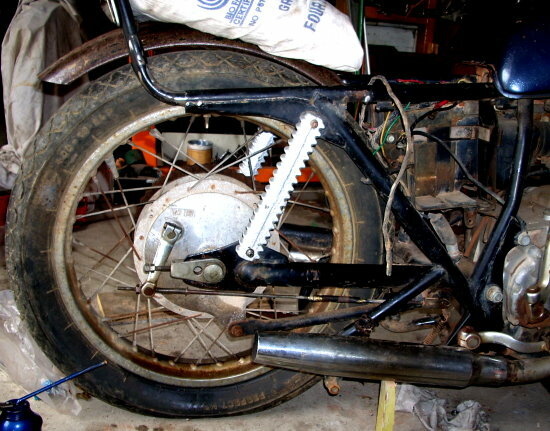 On this side a bit needs to be left to hold the brake return spring... It will be left open for the time being as our chopper jock is going to set up forward controls with a cable running all the way back to the brake lever. 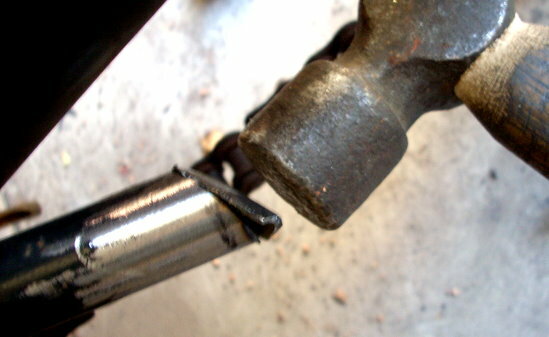 This bit will then be cut off. Top piece of tubing has been left a bit longer so we can close off the end. First step is to slice some tube out so a flap remains. Flap needs to be long enough to fold back across whole tube. If you are doing thins for the first time, practice on a scrap piece so you don't end up too short. 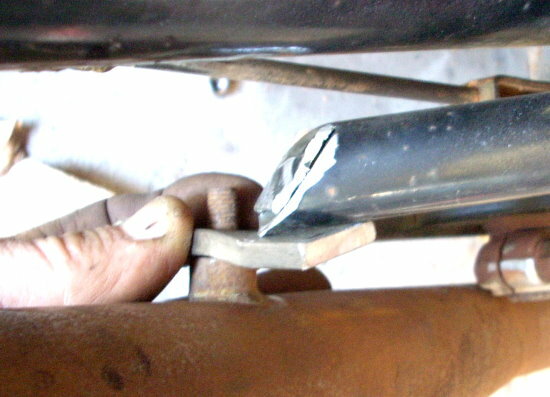 The only way to accurately get your mufflers level is to level the chopper with wedges and a spirit level and then measure from the floor with a tape. Now for the brackets to hold the mufflers on. 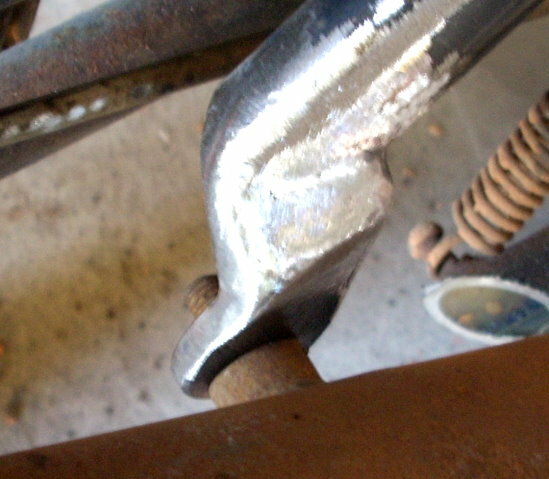 All brackets that hold any weight should be made from steel bar a minimum of 1" x 4mm thick. They have been measured for approximate length and now need to be made. 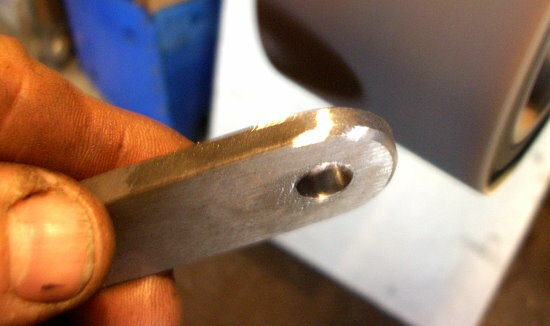 When doing brackets, always measure from the centre of the hole. 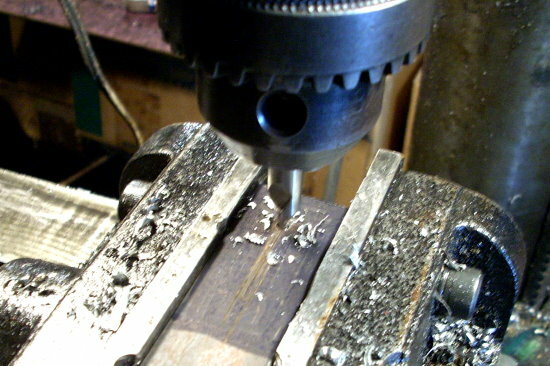 When making a single hole bracket, mark and drill the hole first and then measure and cut to length. Here we have used a verniers to find the centre of the bar and then reset it to the correct length to measure equally in from the end. 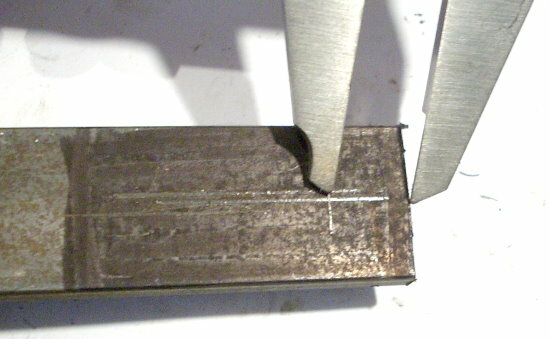 This marks the hole's centre. 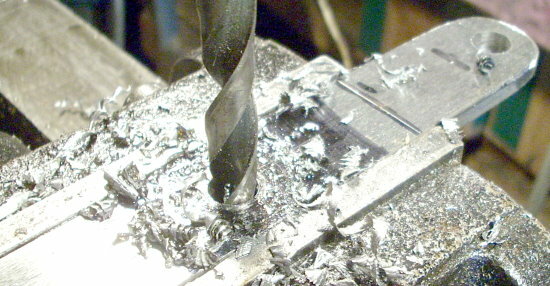 Start with a centring bit, expensive but invaluable, as drill bits wander badly without it. 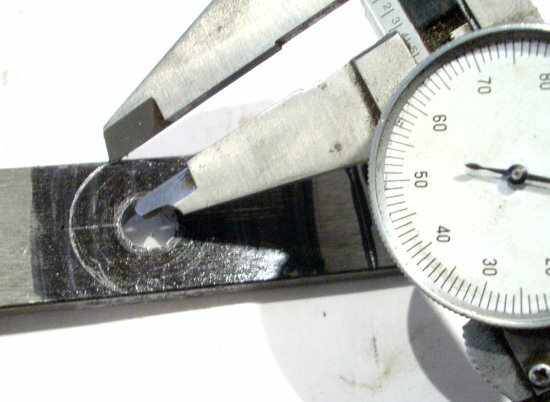 Even a centre punched hole will not be accurate. This is the easiest and neatest way to finish the end of a bracket... unless you are following a theme in which case all brackets might end in a 'spade' or 'clubs' shape or a point. If you don't possess a verniers (shame!) use a washer as a guide. 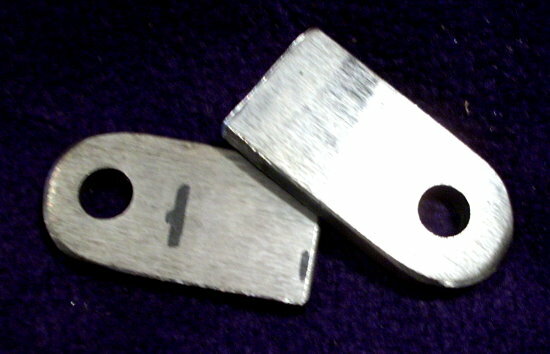 When doing a pair of matching brackets, you may as well do both together then cut them into two... saves time. 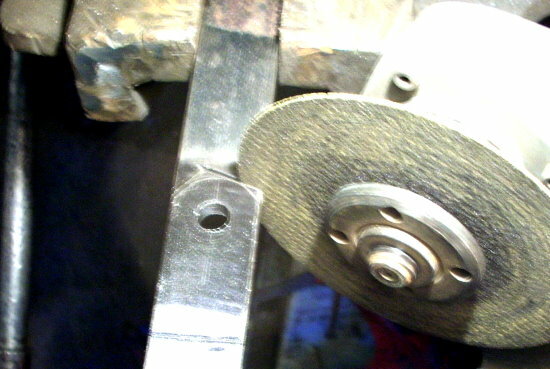 1mm cutting disc allows you to cut most of the curve with angle grinder. Finish the job with a file or get the missus to give you a 'Multitool" as your Chrissy present ... early! 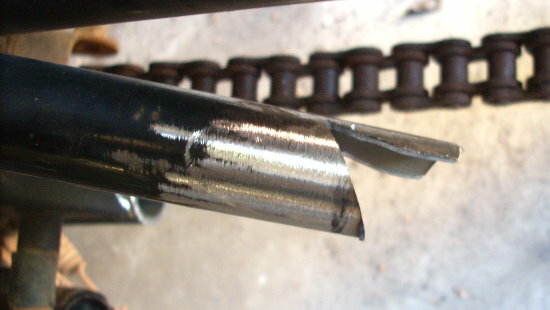 Note neatly arrassed edge, done in a single sweep around the wheel. Job done. 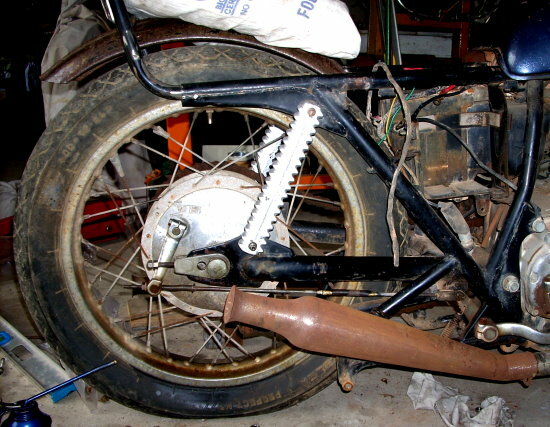 Mufflers painted and bolted on and the chopper is ready for the coming week. Man this feels grrrreat! Am I ever one cool dude! Even his temporary seat (cushion and some lambswool) beats the stocker hands down. Our chopper jockey is already starting to feel pretty good about his bike. This is no longer another bike that's sjut the same as the others. And, at a glance it's starting to spell 'chopper'. The coming week he'll be planning next weekend's moves. He'll attack the front end this time. Well our chopper jock will be spending a lot of nights sitting down with his bike and working out just what has to be done, so all is ready for the weekend. 1. He's picked up a 'Bates' style bottom mount headlight for $20 and will pick up a nice 65/55 +30 globe for it ($15) for some good night vision. 2. He's found a pair of his old man's ape hangers from the seventies... bit bent, but ok. They are a bit high so he'll cut them down and swing the arms back to be more of a pull back style. 3. Speedo/tacho/ignition switch junk will go so he's going to have to partially rewire it as well. Luckily the coming week end is a long weekend, cos he'll be flat out getting that all done. His mates want him to come for a day run, but no way. He's got the bug and nothing is going to deter him from getting his little chopper looking 'the goods' and that means getting the front end cleaned up and as soon as possible putting a 21" front wheel up front that a mate has traded with him in exchange for some welding. Just time for a few hour's run around the back blocks on his new look machine getting ready for the week ahead. It's been a hard weekend and he can't wait to feel the wind in his face on his neat low machine. Awesome job, Prof. Lookin swet already. Our chopper jockey is all set to go, but this old author has too much on his hands. Headlight on GS has been replaced, everything but speedo removed, apehangers installed, electricals remounted and a ton of wiring cut out.... however, I am waiting to get time to finish wiring and get carbs back on so I can run a complete post. All very frustrating walking past it 20 times a day but not being able to find a couple of days to do it. So the 400 just has to wait... so please be patient... just imagine that our chopper jocky is having fun on his new toy and charging around all over the place... rain and shine he has a wopping great big grin on his face! Then I hope to get into the Amen next yeay too when we finish moving so know what its like. This is golden!...... Truly Golden! really like the bike any more pictures? We'll have to assume the young chopper jockey got himself almost wiped out in an accident (car of course, dangerous things that they are! )or something as the job has come to a sudden halt. Actually, the workshop is full of jobs and i've had a pile of other things like CNB's, firewood, house jplumbing and workshop rewiring. Awesome job Prof.. Love the tulip pipes!!! Prof, will there be another installment? I want to know (perhaps others do as well), what happened next? Actually, when I get some choppers completed for customers, get through the mega ride and do some workshop upgrading, I'll get back onto it... It stares me in the face every day... very frustrating... Was going to be well and truly done before October.